Six Peaks Grille at the Resort at Squaw Creek, located in Olympic Valley, California offers a fine dining experience where Chef de Cuisine Chad Shrewsbury creates innovative cuisine and the culinary focus is on steaks, sustainable, biodynamic produce, and seafood. We had dinner at the Six Peaks Grille during two nights of our stay at the Resort at Squaw Creek in late February 2012, where we had the opportunity to experience Chef de Cuisine Chad Shrewsbury's culinary style. 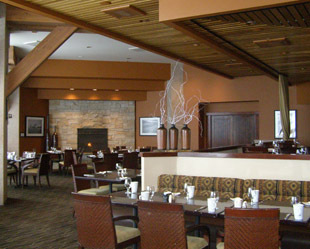 The ambience at Six Peaks Grille was at once stylish, yet comfortable, with its wood beamed ceiling, paintings gracing the terra cotta accent walls, a fire burning brightly in the stone fireplace to take the chill off the cold, wintry night, and the expansive wall of windows overlooking the mountains that emphasized part of the reason why one comes to the Resort at Squaw Creek, for the magnificent beauty and the plethora of activities and amenities, in addition to the excellent quality of the cuisine and the service at its restaurants. The Six Peaks Grille menu is well-thought out, with a diverse selection of steaks, seafood, and pasta, and reading the menu we learned that the "Resort at Squaw Creek and Destination Hotels and Resorts is committed to setting a new benchmark for hotels and resorts through a series of environmental initiatives, which include an emphasis on sustainable agriculture in the form of organic items featured on their menus that are guided by principles of sustainability;" something of which to definitely be proud of, as well as inspire others to achieve. 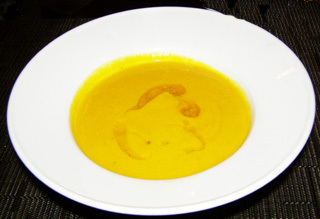 On our first night dining at the restaurant, Edward and I began with a bowl of Butternut Squash Soup with vanilla bean, brown butter, and purple sage. 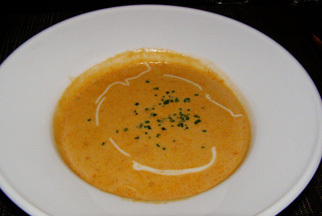 Smooth and delicate, the hint of vanilla added interest and appeal to the delectable soup, which was the perfect starter. As a backdrop to our first course, we also enjoyed watching the swirling snow as it continued to fall, and gazing almost hypnotically at the burning logs in the outdoor fire pit. 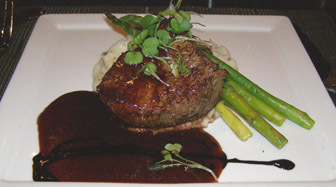 Edward continued with an entrée of tender Filet Mignon elegantly presented on a bed of whipped potatoes, with tender asparagus tucked alongside, garnished with micro greens, and served in a rich, flavorful pool of port wine demi glaze. 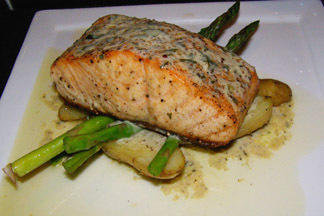 For my entrée, I had the Wild Salmon, another artistically presented course with a generous portion of salmon presented on a bed of asparagus and fingerling potatoes cut in half lengthwise, and enhanced with a classic béarnaise sauce. 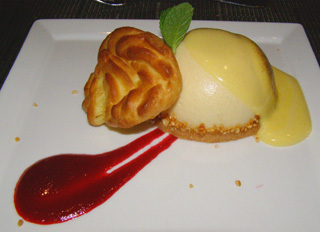 We ended our dinner on a deliciously sweet note, enjoying a Lemon Cheesecake Profiterole with a nutty crust base, served with Marsala sabayon, and a luscious swirl of raspberry sauce to complement and contrast with the lemon dessert. The second night that we dined at the restaurant we were equally impressed with Chef de Cuisine Chad Shrewsbury and his menu. Edward and I began our evening with starters of steaming bowls of cognac infused Lobster Bisque served with crème fraiche and dusted with tiny, minced chives, again, the perfect foil on a cold wintry evening to warm the spirit as well as the body after spending the day skiing. 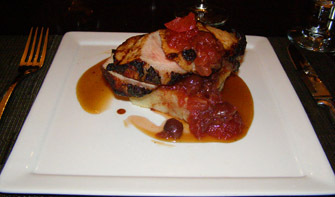 Edward continued with an entrée of Heritage Farm Pork, a generous portion of sliced pork presented on a bed of bacon potato hash, and topped with a mélange of wild fruit chutney, and enhanced with a bourbon glaze. The flavors really worked well in this satisfying dish, and the colorful presentation was a treat for the senses. 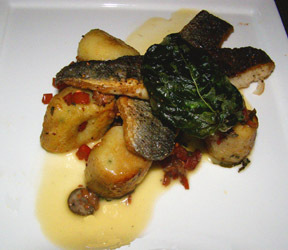 I had the Branzini Sea Bass, which was grilled to crispy perfection and presented with gnocchi, sliced olives, caper berries, hothouse tomato relish, and a fried basil leaf garnish as the crowing touch. This was another stellar dish where the Mediterranean flavors worked well to showcase Chef Chad Shrewsbury's style and the delicate fish. 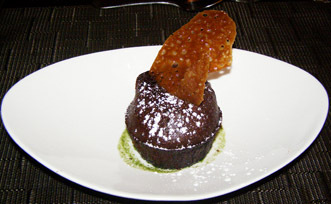 We finished our elegant dinner with the Chocolate Lava Cake, a small and delicious intense confection with a liquid dark chocolate center presented on a bed of mint syrup, lightly dusted with powdered sugar, and garnished with a miniature Florentine cookie. Six Peaks Grille is open for Breakfast, Lunch, and Dinner. 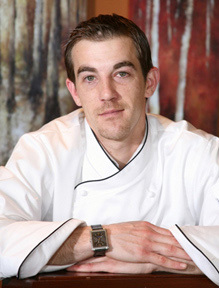 Read the Chefs' Recipes section where Chef de Cuisine Chad Shrewsbury shares a delicious taste of Six Peaks Grille with his recipe for Crispy Lamb Sausage with Toasted Fontina Cheese, Water Cress, Egg Yolk, and Romesco Sauce. Read more about the Resort at Squaw Creek in the Destinations, Hotels and Resorts, Restaurants, Chefs' Recipes, Spas, and Adventures sections. © March 2012. Luxury Experience. www.LuxuryExperience.com All rights reserved.